If I haven’t already convinced you to make an edible holiday gift this year, maybe this recipe today will seal the deal. It has to be one of the easiest recipes to throw together using less than 10 minutes of precious holiday time. Plus, it’s a recipe you can make well in advance without having to worry about it going bad any time soon. Just pop it in a jar and leave it on your shelf, tucked away until that special someone pops over for a visit. I think we’ve just entered Martha territory here! I figured my goal of having a crispy coating of granola would only be possible with a very sticky base – almost like a “glue” for the granola to adhere to. Brown rice syrup worked wonderfully for this task. Simply pour a few tablespoons of syrup onto the nuts. The key here is to stir the nuts very thoroughly until every nook and cranny is covered with syrup; this ensures the granola has every chance in life to succeed! After coating the nuts, stir in the granola mixture until combined. 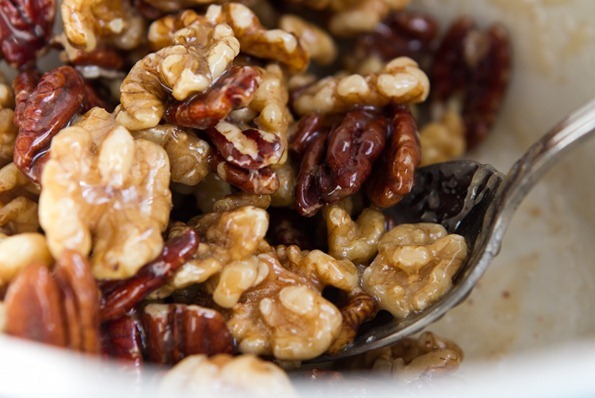 The granola will stick to the nuts, forming a homely-looking coating. Don’t worry though, it will caramelize and turn golden in the oven leaving big clumps to break apart with your hands! After 20 some odd minutes of baking at 275F, you’ll be left with seriously addictive granola-coated nuts, delightfully crispy on the outside and tender in the middle. I don’t think I need to tell you that Eric and I polished off my first trial within 24 hours. Consider this your warning (or encouragement). 1. Preheat oven to 275F and line a baking sheet with parchment paper. 2. Place walnuts and pecans into a large mixing bowl. Pour on brown rice syrup and stir very well until combined for about 60 seconds. Your goal is to have every nook and cranny covered in syrup. No pressure! 3. In a small bowl, whisk together the oats, coconut, sugar, cinnamon, and salt. Pour it onto the nuts and mix very well until combined. Some of the oat mixture won’t adhere to the nuts, but that’s ok because it adds character. 4. Spoon the entire mixture onto the baking sheet including any oats that didn’t stick. Spread into a single layer so they have room to get toasty. Garnish with fresh nutmeg. Bake for 10 minutes, rotate the pan, and bake for another 10-13 minutes (I baked for 23 mins total) and allow to cool on the pan for at least 10 minutes. 5. Once cool, break apart clumps and store in glass jars or Tupperware containers. I expect these would stay good for at least a month. Substitution Notes: 1) Brown rice syrup works amazing in this recipe because it is so crazy sticky. For this reason, it can be difficult to replace it in a recipe that requires its binding properties. I haven’t tried anything else, but if you eat honey that might work or even coconut nectar since both are very sticky. 2) You can substitute Sucanat with brown sugar or with Turbinado sugar. I don’t recommend subbing with coconut sugar. I tried this and found that it dried the mixture out due to its powdery nature. You might be wondering if you can use other types of nuts. I recommend using craggy nuts like pecans and walnuts since smooth nuts (like almonds) don’t have the rough texture to “grip” the granola. You can certainly try any nuts you wish though! As always, I would love to hear your feedback in the comments if you try out this recipe or your own modified version. I’ve been trying to think of what to bring to a mixed-group potluck tomorrow afternoon. I think we have a winner!!! Thanks for posting yummy stuff like this. 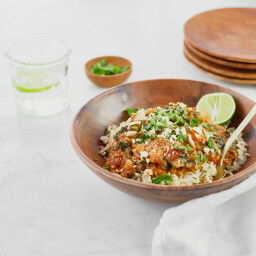 Ohsheglows.com is my go-to site when I want something new to feed the family because I know it will turn out great! You rock! I’ve made Fruit Ketchup this year and should make this granola also. What a nice gift! I just made my versions of Deb’s granola nuts the other day for our holiday party. I used flax egg instead of the egg white, and a bit of maple syrup in addition to the brown sugar. Spiced with cinnamon, cloves and nutmeg, these were a hit with everyone! Okay Ang, you have me SO convinced! I love this idea and it is something I personally would love to have. ;) thanks!! The best part of my favorite cereals! I picture the Mr coming home asking where the granola is and me pleading innocent with oats between my teeth. What a wonderful gift I doubt they would even make it to the jars or even to my friends and family I could would not be able to help myself and my sweet tooth… I love nuts and sugar oh such a perfect combination!!! 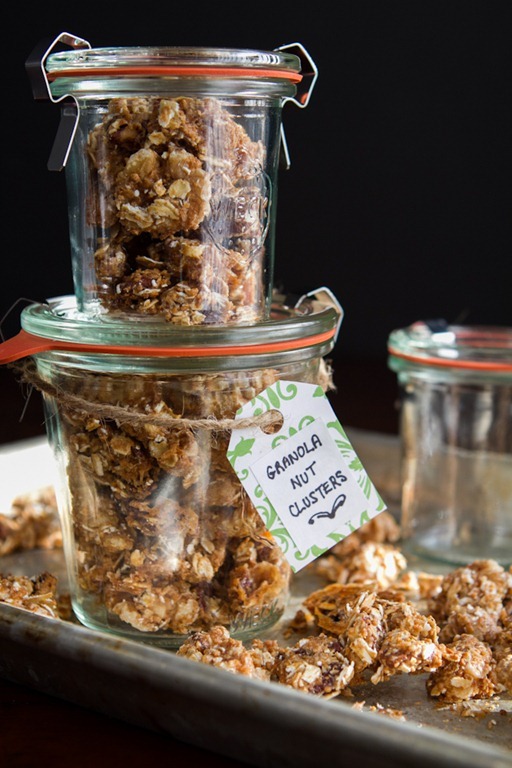 I love making granola clusters to give as gifts! They are easy to make and sure to please! The best part of granola! The clusters.And nuts covered in granola is such a wonderful addition to life. Great Holiday gift for sure. 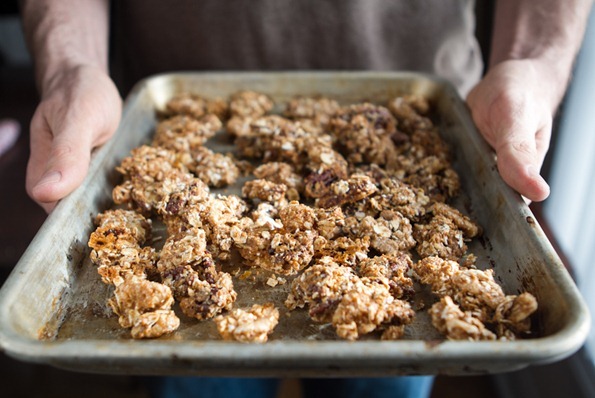 Any kind of chunky and oat-filled granola, that can double as a make-ahead gift or portable snack, is a total win. Love any of Deb’s recipes and your version is a winner, too! Oh wow, that looks delicious! I love how you packaged them in those beautiful jars with the tag and twine. I love stuff like this. I know just the person to make this for too! Thanks for the inspiration! Great recipe! We’re spending the holidays with my family which means travel travel travel. I love bringing goodies, but I have to be careful because we have to take things that are allowed into the USA, that travels well and that won’t go stale before we get there! This is perfect!!! Your pictures are out of the park on this post! Love them. I have also been vegan-izing some of Deb’s recipes, they are always still amazing!! This looks amazing. Thanks so much for veganizing (and reminding me of) this recipe! I was dying to make it as soon as it went up on Smitten Kitchen. Maybe this will help me get my boyfriend to try some more vegan foods. Is your husband vegan as well? hah it’s hard to resist a vegan dessert! Eric isn’t a vegan, but his diet is probably 80-90% vegan now. He still drinks organic cow’s milk and has meat occasionally when he goes out, but he has really taking a liking to vegan dishes that I cook. I’m a big fan of granola clusters. I like clumpy/lumpy textures so this seems like the perfect granola for me!! This looks fantastic! I love homemade gifts especially edible ones. Your pictures are always amazing! Makes me want to make them right now! Only not to give as presents…for me to eat :) They look too good to share! I’m so glad you posted this recipe! I saw deb’s recipe for these a while back but was wondering how I could make a vegan version for my boyfriend but didn’t think a flax egg would do the trick. Now I just gotta go out and get some rice syrup. Thanks for all your great recipes…I’ve made quite a few of them over the past year and they’ve all turned out wonderful! 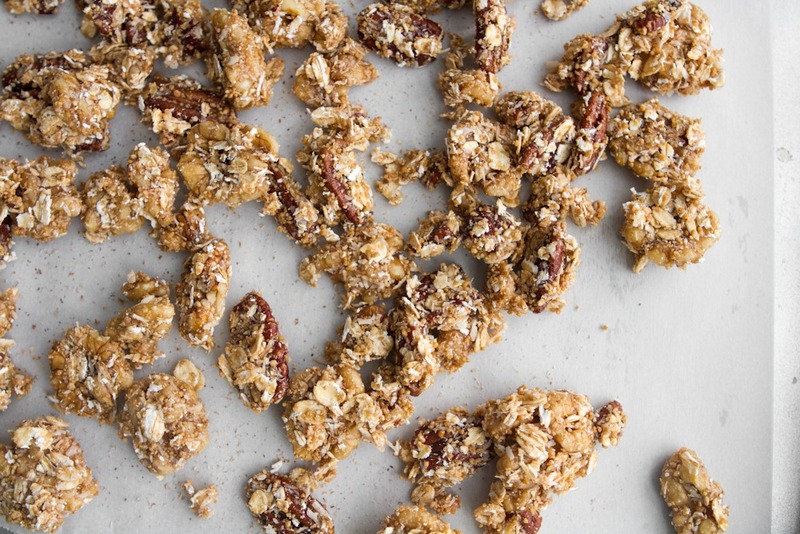 These look so crunchy and delicious – I LOVE granola! I’m sure this will be dangerous to have around the house…. Looks so yummy and perfect for gifts! Really only 6 T of oats? Doesn’t seem like that would yield 3.5 cups?? Do you think maple syrup would work in place of brown rice syrup? I know it’s not as thick, but I prefer the flavor. It probably wouldn’t stick as much (you’d probably end up with granola with big nuts in it!) but im sure it would still taste great anyway. Let me know how it goes if you try it! I love to make edible gifts, and in fact last year I gave an edible gift to all of my closest friends and family members. It’s so personal and everyone appreciates it. A few years back I made some nice glazed nuts for a little pre xmas dinner nibble, but never thought to give them as gifts. 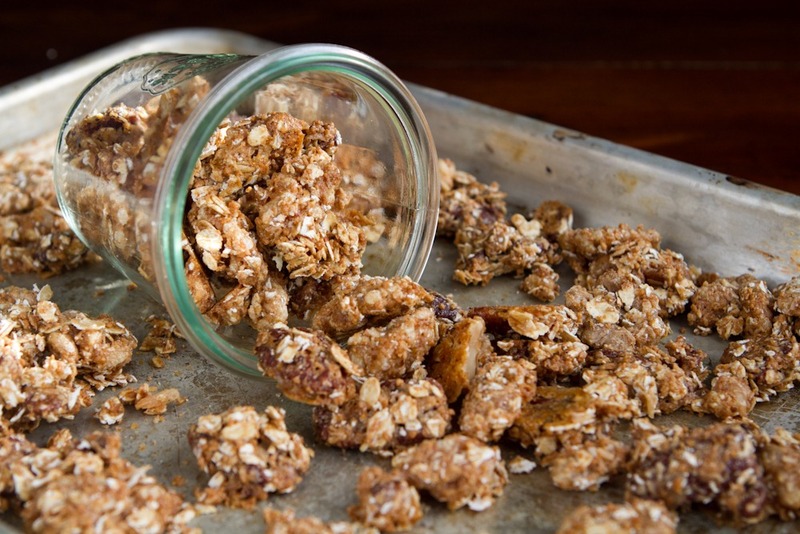 These granola nut clusters sound delicious! Of course, I’ll have to make a test batch (or two) for myself, you know, just to make sure they taste alright..
Looks delicious, I love those jars, I feel like they make everything look more desirable and appetizing. Your timing on posting this is perfect! I’ve been looking for a homemade edible gift to make for my family for Christmas. I’m definitely making this recipe! Thank you so much! Your recipes are always delicious! I just tried making these, followed the recipe exactly and they came out great! It doesn’t look like you are making much when you start to mix everything in the bowl, but after putting it in the oven it does increase in volume. It’s magic! :P And I found the exact jars at crate and barrel too. What a cute idea! I love this cluster idea, but for portion control! Making clusters so 1 or 2 equals a portion would be great for me. Granola is really easy to overdo! These are super cute Ange! I think I saw something similar on Pinterest and you’re totally making me want to start crafting this weekend! I just got back from California (work, not play unfortunately) so laundry’s gotta come first! I saw this on Smitten Kitchen, it’s on my must make list!! Love the changes you made and it looks fabulous! I can’t wait to make it! I’m wondering if coconut nectar would work? If you enjoy the flavour, I can’t see why it wouldn’t work! Why is brown rice syrup still on the menu? It’s full of arsenic! Hi Mike, Feel free to swap brown rice syrup for another sticky sweetener like honey or coconut nectar. I use it in very small quantities and I also don’t consume a lot of other rice products in my diet. What a coincidence! I made some granola with lots of nuts yesterday (although not enough nuts to compare to these clusters). Guess I have something new to try after I finish off my batch! Oh this is a fantastic idea! This is my first holiday after having moved far away and I’ve been wracking my brain trying to think of something that I could fly with that wouldn’t take up much room or have to worry about wrinkling wrapping paper etc. I would expect they would last for at least 3 weeks in a sealed conatiner. Granola tends to last quite a long time I think. Hi! How long do these last for? Im not positive but I would expect they would last for at least a few weeks in a sealed container. they last about 1-2 days, then you’ll need to make more! lol!! Thank you so much for sharing this great idea! I’m sure it’s delicious, and I absolutely love the idea of preparing these beautiful jars as gifts for my friends. Thanks again! I know what my co-workers are getting for Christmas! Beautiful, easy, and delicious! Hey Cynthia, I’m not sure how soaking would impact the overall outcome in this recipe. I think you might have to soak them and then dehydrate before proceeding? Thanks, Angela, these are just in time for me to take to a friend’s Christmas Brunch! Where do you find the cute tags to identify the contents? Hey Karen, I made them myself just using scrapbooking paper. I printed a tag online and just traced it. 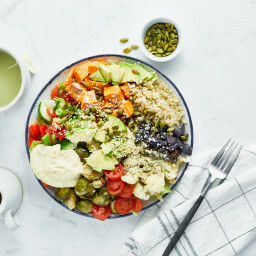 I am definitely making this a staple for my christmas giving, thank you, ever since I came across your site I am hooked, I look forward to trying everything, I just transition little over year from a vegetarian to vegan diet, your ideas and dishes has made me realize that this lifestyle is actually fun and exciting. Where can I get those containers you use.? Hey Barbie, The Weck jars are from Crate and Barrel. Thanks for your kind words! Oh must try it! Looks so tasty! This might be the most amazing new holiday recipie inspiration Ive seen lately–this is getting done on my next day off!! I cant wait to try this. Thanks angela! These sound amazing! Such a unique gift idea – though I’m not sure I’d be able to keep my hands off them from now until Christmas! Next year we plan on making a couple of things, and these nut clusters just might be one of them. I would guess it would still turn out! You might need to add more oats? I made a test batch of these last night as a pre-gifting trial run. Oh. My. Gosh. They are SO good! They’re not going to last long enough to find out how long they keep. Brava, Angela, another triumph! these are irresistible! I had walnuts and almonds, so that’s what I used. Also had no coconut, so I left that out. Had no parchment paper, so I used foil. I can’t quit eating them! YUM-O!! These are AMAZING and addictive!! I made a double batch yesterday for a brunch I’m hosting tomorrow. I have eaten so many that I might have to make a second batch in the morning. Also, I couldn’t find brown rice syrup, so I subbed half honey (not vegan, I know) and half cane syrup. Worked beautifully. The cane syrup was too strongly mollasses flavored on its own, which is why I cut it with honey. Question: I made two batches of these. The first one, made a few days ago, was perfectly crispy. The second batch (made today) came out soggy (still yummy, just different). I didn’t do anything differently that I noticed. Could today’s rainy weather be the culprit? Delicious, Angela. Thank you for sharing! These are AWESOME! I made 4 batches yesterday! I added sliced almonds to my last 3 batches and it worked great. People sometimes give me a hard time because of all the “health nut” food I eat, I can’t wait to give them a jar of these clusters to prove how good natural food tastes! Made this tonight and it is SO YUMMY! Hi there, has anyone tried adding dried fruit like cranberries or raisins to this recipe? Thankyou so much for this post! These were so fun to make and really do taste as good as they look, especially in jars! totally gift-worthy. Will have to be brave and give a jar to family (they are skeptical of anything I eat). I used a mixture of honey and golden syrup, fab! My clusters were less nuggety looking than yours but I don’t mind. I love this type of vegan baking, you just can’t go wrong! Have a merry christmas Angela, I know I will with another batch of these… and some more cute jars! These are freaking delicious! I made 2 batches to give to the guys I work with and I had plenty leftover to taste test :-) I used coconut nectar in place of the brown rice syrup and I only used a little tiny amount over 4 Tbs (for 2 batches) of brown sugar in place of sucanat. These were still so good and the diabetic guy I work with loved them. I also delivered them in mason jars with homemade lemon flavored toothpicks. It was a big hit and I’m thinking of giving the leftovers to one of my close friends. I absolutely know her kids would love them! Thanks for an awesome vegan recipe! Thanks so much for this amazing idea! I made a triple batch for all of my work colleagues this Christmas! It is so easy and so delicious! Can’t wait to give them out in the little jars! I ran out of pecans halfway through and so used almonds as well – still worked beautifully! I made this yesterday subbing molasses (I figured if anything would be sticky enough, molasses would be) for the brown rice syrup and they tasted great! I’m not sure how the taste/shelf time with molasses compares to the original, but the results were yummy! Just made a batch and have another in the oven… delicious! Thanks so much for the recipe!! These are insanely addictive! I made a double batch yesterday – half to gift, and half to keep for my family and I. Haven’t been able to stop munching since! The Granola lasted about a half hour in our house. Made several batches and gave as gifts this Christmas. Big hit!! Thanks for this blog, it is helping to my husband and I survive our transition to veganism. I substituted agave nectar for the brown rice syrup and it’s actually delicious and binds well still. I’ve made similar recipes that call for maple syrup and that works too. I made these with brown sugar and honey (for a non-vegan option) and they came out delicious! Here is my version of your version. Lovin your blog!!!! This is DELICIOUS!! Anyone would be happy to get this for a gift. This is a great web-site so glad I ran across it. Thanks for all the wonderful recipes! I love love love love these granola nut clusters. I made them for Christmas gifts, and now I make them for myself! I use any mix of nuts that equals to 1 1/2 cups. These are dangerous…. once I start eating them it is so hard to stop! Just made these, with a mix of peanuts, almonds, cashews and a few leftover walnuts, and using quick-cooking oats (because that was what I had around). The clusters came out a bit smaller, but despite the smooth nuts and inferior oats all still worked marvellously. They are so good! Dangerous. I’ll have to give them away before I eat them all. These were really good, but I decided to make a few changes, & I personally like it better. I use 2 c. pecans broken into large pcs. Add 4 Tbsp. pure maple syrup (in a large bowl). Mix really well, about a min. In a med. bowl – 1c. + 2 Tbsp. oatmeal, 3/4 c. coconut, 1/2 c. ( or a little less) sucanat, scant 1/2 tsp. salt & 1 tsp. cinn. Stir and add to nuts & syrup. Stir again for about a min. Spread on parchment lined cookie sheet. Sprinkle with a little more cinn. Bake for 14 min. at 275*. Turn without stirring and bake 14 more min. Let cool and then break into pcs. I have to make this at least once a week if not more often. These are amazing! First ‘granola’ recipe I’ve made where the clumps actually stick together once out of the oven :). I’m trying to gain weight at the moment (and am not much of a cake/cookie person), so the fact they’re so moreish is perfect for me! These have got to be the best nut treats I have ever tasted! I just made a batch and needless to say it’s half gone…I had to pry myself away from the gooey scrumptiousness. I see my husband getting up every five minutes making his way to the kitchen for “one last bite.” Will definitely be using these for this year’s holidays! These are so great! I made 2 batches in the last 12 hours… I woke up at 3am and decided to make more as gifts. Thanks! I’ve already been planning to make several batches as Christmas gifts again this year, they were such a hit last year. This recipe is a lifetime keeper. These are possibly the yummiest thing to ever enter my mouth. MMMMMMM. I used coconut nectar and it worked great. Sooo delicious. I added dried cranberries and dark chocolate chunks once cooled and had it in the car as a road trip snack for the little ones when we went on vacation. Delish! These have become a staple in my diet. They’re great for bundling up during holiday time and giving to coworkers too. They’ve been a hit among anyone who’s tried them whether or not they’re vegan. Its out of the oven and cooled. Smells like caramel over here:-) Its PERFECT!! Only regret is why in the world didn’t I make more? :-) The buckwheat honey works beautifully here. I didn’t add any other sugars except for the honey. LOVE! I made mine with coconut syrup and loved the taste! Thanks for the recipe! Omg we have falled in love with this recipe and have made it twice in a week already. I followed the recipe except for subbing with honey. However, I am having some trouble, not sure what I am doing wrong, after baking the nut clusters are getting stuck to my wax paper that I use to line the tray…it takes forever to scrap the paper off each cluster. I even tried spreading some oil on the paper but that did not help. Help! What am I doing wrong?! Hi, I live in Italy and can’t seem to find brown rice syrup, can i substitute it with maple syrup, as i don’t love honey? Also, by using that should i cut down the amount of sugar? Hi Eliza, Brown rice syrup can be difficult to replace in this recipe, because its awesome binding properties (it’s so sticky!!) are really key. I think substituting maple syrup will still taste GREAT — but the granola might not “clump” together into clusters as much as we’d want. Please me know how it goes if you try it! I’d love to hear back. I have been making this for a long time and love it! Do you happen to have calorie/nutrition info for this? It would be helpful. Thanks so much for these tips-I had no idea they existed. I would like to lose 10 pounds, and this is the first time in my life I’ve had to count calories, so this will make it easier.